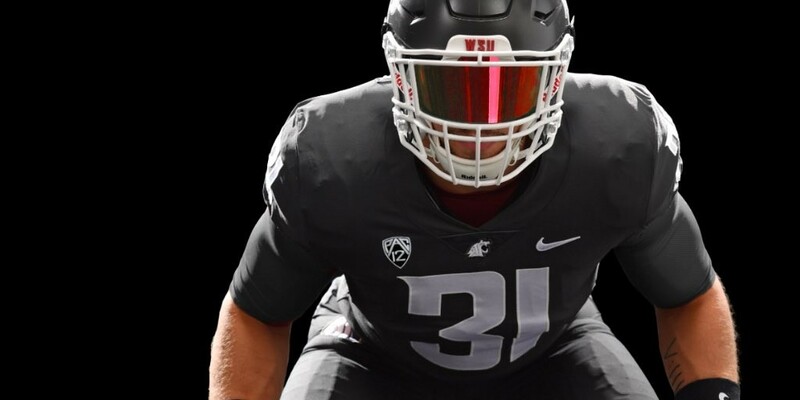 Tonight, the Cougars will be clad in new uniforms notable for their lack of crimson and abundance of dark gray. It's been circled on the calendar, and noted a month ago by the Inlander. Now it's here, and everyone has an opinion about what's going to happen tonight in Pullman, including Las Vegas bookies. Southern Cal and Washington State enter tonight's game at Martin Stadium (7:30 pm: ESPN, KXLY 920 AM) in familiar and unfamiliar positions, respectively: the Trojans where they expected to be, undefeated (though not untested) at 4-0, 2-0 in the Pac-12, ranked No. 5 in the country in the latest Associated Press poll. The Cougars are where they hoped to be, thanks to a cardiac-kids fourth-quarter finish and a 47-44, triple-overtime victory over Boise State 20 days ago; also unbeaten through four games, 1-0 in conference, though against a lesser schedule than USC, with all four games on the Palouse. Wazzu is ranked 16th in the AP poll, the highest it's been in 14 years. One thing the Cougs don't have on their side? History. This series — it's nowhere near a rivalry — is one of the most lopsided on the West Coast, or anywhere else: the Cougars have played the Trojans 71 times dating back to 1921, and won nine times, managing four ties, which won't be a possibility tonight. That's not to say the Cougs don't have a chance — far from it. But they have to play better, in all three phases, than they did in dominant victories against the Big Sky's Montana State, the Mountain West's Nevada, and Oregon State, after one month the Pac-12's patsy. The Trojans, who have an overtime victory of their own (in double OT, two weeks ago at home against Texas), have otherwise stacked the wood at the Coliseum, with an unimpressive season-opening win over Western Michigan and a dominant conquering of Stanford, a much better team than the Broncos, who were hard-pressed to beat Idaho at home. Last week, SC won by 10 at Cal, pulling away late to break a fourth-quarter tie, as the Trojans did in their opener. Many believe this game will come down to the quarterbacks: WSU's record-obliterating senior Luke Falk and USC's Heisman-friendly sophomore phenom Sam Darnold. But more than that, it comes down to the ability of the Cougars and Trojans' respective offensive lines — and tight ends, and running backs — to protect their teams' most important assets. If the Cougs can keep it close late against SC, as the Golden Bears and Broncos did, they possess the experienced defense and offensive firepower (and frenzied home atmosphere; see below) to be the team that wins the fourth quarter tonight. These are college kids — 19, 20, 21 years old — not highly paid professionals. Student-athletes (or in some cases, athlete-students... just sayin'), not gladiators. Even a Goliath like Cougars offensive lineman Cody O'Connell, who at 6-foot-9 and 370 pounds has "Future NFL Star" stamped all over him, is just a big 'ol kid from Wenatchee. The players taking the field tonight are fallible; they're going to make mistakes, and their performances may disappoint. Put yourself in their cleats, and remember that being a good sport — and a decent human being, capable of empathy — is fundamental to being a good football fan. Some Cougar fans — a small minority — have a not-undeserved reputation for violating the boundaries of good sportsmanship, especially in 7 or 7:30 starts [see: any nighttime Apple Cup game at Martin Stadium]: Resist the temptation to reinforce easy stereotypes, especially in front of a national viewing audience. Win or lose tonight, leave a good impression.